The official currency in the UK is the British Pound Sterling (GBP), and is decimal based like the dollar, there are 100 pence in a pound. 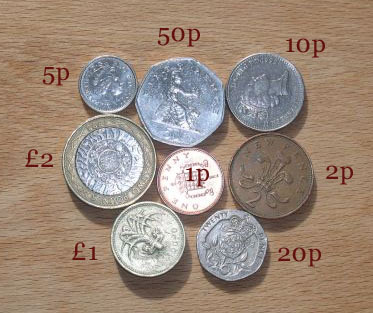 The coins are 1p, 2p, 5p, 10p, 20p, 50p, £1, £2. The notes are in demonations of £5, £10, £20, and £50. You won’t often see the larger notes any more to combat loss to counterfeits. Thank goodness we haven't had to deal with the previous system of currency which was in place only just from the early seventies where there were 240 pennies to a pound (12p = one shilling). 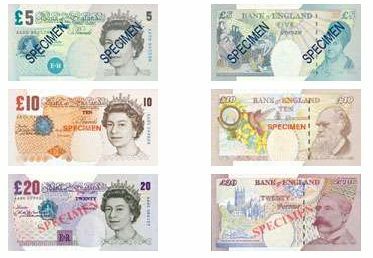 The British call their bills "notes" only, never bills. A common nickname for the pound is "quid", similar to how the "buck" is a nickname for the American dollar. There are other currencies as well, though I’m under the understanding that in Scotland, some of the Channel Islands and elsewhere, they have their own printed/minted coins and notes, they are exchanged at the equivalent of the Pound Sterling. Scottish notes are legal tender in the rest of the UK, but Channel Islands notes and coins are not. The Euro is a topic of great debate. In short, it is a “new” currency that has begun in recent years in the European Union. Britain however has not gone in as of yet, still after near 10 years. They are waiting to see how it goes in the other countries before they join, and there is a strong public opposition to doing so. There are very few shops that are taking the Euro so it is not advisable to use Euros if visiting, you also will get a lousy exchange rate in the shops that do. You will be able to exchange Euro's at Travel Agents, some banks and post offices. There is more about the Euro and the UK's aversion to joining it here, UK and the Euro (Wikipedia). Bank accounts are more difficult to get in the UK than any of my experiences in the US. Even to be added as a joint holder of a long standing account, you’ll need bank references from the US, or wait to have been resident for a few years, but each bank is different. Some things are more expensive in the UK and some things are cheaper and it sometimes depends on how you look at it, but they don't call it "rip-off Britain" for nothing. We compared the costs of transferring money with Paypal, Banking, Western Union and TransferWise. UK Yankee has chosen to partner with TransferWise to share the best transfer rates possible with you. Finding a job in the UK is nearly the same as in the US, a resume is referred to as a CV or curriculum vitae, meaning life story. If you’re looking for an employer to hire you from abroad, it is very difficult to find one to do so, because they have to explain why they cannot find a local citizen to do said job.